Classified Websites have made it easier to sell or buy any product online. Now you don't have any need to find people to sell your product. Just post your ad and your product is sold. Yeah! that's the truth. These classified sites have thousands of active users, you just need to list your product and then it can be seen by desired person. Similarly if you wanna buy something then simply search your query and website will present hundreds of purchasing options for your desired query. So today we're having a collection of 100+ best and top active classified websites list. These sites allow to post advertisements for selling or buying of product, jobs, real estate, matrimonial, travel, vacation, employment, print media and much more. So make your advertisement live online and sell or buy your items. Below is a list of all active classified sites, use the for ad posting. 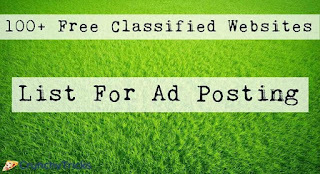 So this was all about free classifieds websites list to post your advertisement. All the websites are hand-picked and tested. So they all are active. If you have such more quality active sites then mention it in the comment section below. Also if you have any doubt or query then feel free to leave a comment below.